I have decided to do a series of Bandon Sunsets. The varying light, intense colors, clouds, waves, reflections and multiple rock formations come together in so many ways and are inspiring me to paint more of Bandon Sunsets. And just for fun, this painting has two main rock formations and is named Bandon Sunset 2. 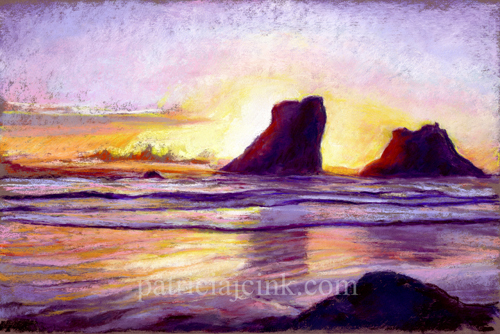 You can view the original Bandon Sunset painting on my post from September 21, 2012. I have Bandon Sunset 3 with three rocks and Bandon Sunset 4 with four rocks in the works.